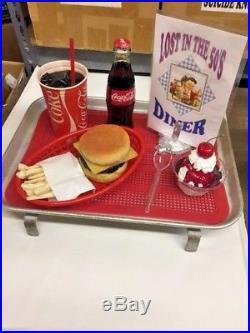 WELCOME TO “CHUCKS 50s GARAGE”… SOME OF THESE ITEMS ARE VERY RARE AND SOME HAVE NEVER BEEN OUT OF THE BOX. I ALSO WILL BE LISTING SOME REALLY COOL DISCONTINUED OR OVERSTOCK ITEMS THAT YOU WILL LIKE.. JUST IN TIME FOR CAR SHOW SEASON. 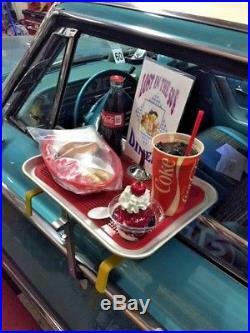 DELUXE CAR HOP TRAY SET WITH VINTAGE TRAYCO TRAY COMPLETE AND READY TO MOUNT. 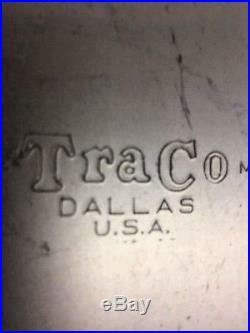 1 Vintage TRACO Car hop Tray (the way it really was)12 by 17 inches. 2 Red rubber spill mat. 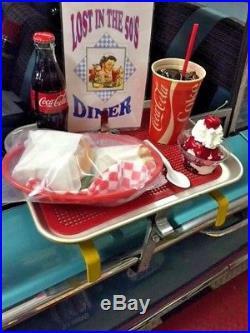 3 FAKE Cheese burger and fries in the traditional red basket. 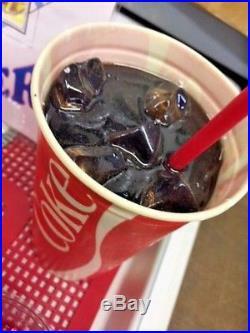 4 Fake cup of Coca Cola with straw and ice. 5 Real bottle of Coca Cola. 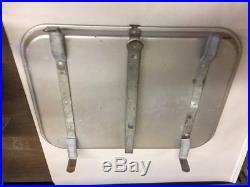 6 Lost in the 50s menu and chrome holder. 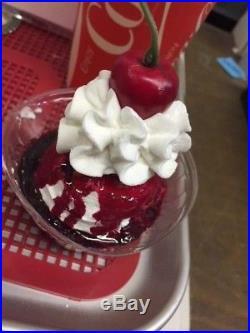 7 FAKE Cherry Sundae with spoon. 9 no GMOs No Calories No Sugar haha. Looks real Fool your friends. IT WILL BE WELL PACKED FOR SAFETY. 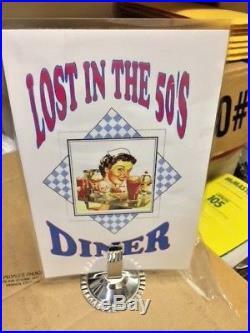 Lost in the 50s brings you. Another Great Car/Truck accessory or collectible to complete your Build, Ride or Man Cave. Dealing with me is smoother than a pocket full of Jello. The friction will light your cigar. I’m here to help you make the right choice. And I won’t lie to you to make a sale. 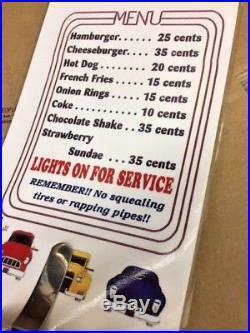 For the amount they will charge you. COMBINE ITEMS: No problem. Ask Questions to avoid problems. Check my feedback and you can see that my buyers like what I do for them. I will go out of my way to help them as much as possibile. Thank you for your support! My terms are simple. Paid as I also work fulltime. Mostly on Light small. Pick ups by appointment only. 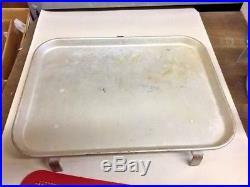 The item “DELUXE CAR HOP TRAY SET WITH VINTAGE TRACO TRAY COMPLETE AND READY TO MOUNT” is in sale since Wednesday, June 13, 2018. 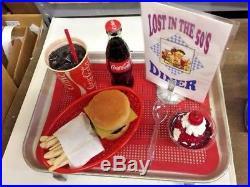 This item is in the category “Home & Garden\Food & Beverages\Fake Food”. 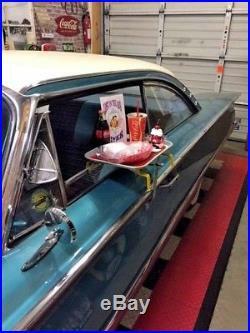 The seller is “chucks50sgarage” and is located in Valencia, California. This item can be shipped to United States, Canada, United Kingdom, Denmark, Romania, Slovakia, Bulgaria, Czech republic, Finland, Hungary, Latvia, Lithuania, Malta, Estonia, Australia, Greece, Portugal, Cyprus, Slovenia, Japan, China, Sweden, South Korea, Indonesia, Taiwan, South africa, Thailand, Belgium, France, Hong Kong, Ireland, Netherlands, Poland, Spain, Italy, Germany, Austria, Israel, Mexico, New Zealand, Philippines, Singapore, Switzerland, Norway, Saudi arabia, Ukraine, United arab emirates, Qatar, Kuwait, Bahrain, Croatia, Malaysia, Brazil, Chile, Colombia, Costa rica, Panama, Trinidad and tobago, Guatemala, Honduras, Jamaica, Antigua and barbuda, Aruba, Belize, Dominica, Grenada, Saint kitts and nevis, Saint lucia, Montserrat, Turks and caicos islands, Barbados, Bangladesh, Bermuda, Brunei darussalam, Bolivia, Ecuador, Egypt, French guiana, Guernsey, Gibraltar, Guadeloupe, Iceland, Jersey, Jordan, Cambodia, Cayman islands, Liechtenstein, Sri lanka, Luxembourg, Monaco, Macao, Martinique, Maldives, Nicaragua, Oman, Peru, Pakistan, Paraguay, Reunion.